Seriously - I ain't kiddin' ya! Just look at the pictures - they speak for themselves! Don't say I didn't warn ya! Seriously - that would hurt!! I'm just sayin'! People!!! I TRIED to warn you, but you did NOT listen! What do I have to do to get you to listen to me? Oh, don't give me that "It's your CC post, and I had to look." excuse. Does that not feel like it's boring right into your brain, or what??? Hey... come back... it's O.K. I didn't mean to scare ya! He does seem a bit critical about you and your camera :) Lovely pictures, do you by any chance know the exact species? I think it's some kind of starling, but can't get further than that. Great shots, tho. Thanks for sharin' em, and have a great weekend ahead! Lots of good photos and information. Thanks! more birdies...yes...I LOVE camera critter day!!! The bird might have an evil eye, but he is beautiful, no doubt about that! Have a great weekend! WOW! Wonderful colors! I love those 'shiny iridescent' feathers! Mist, that third shot is BRILLIANT!! He he - he sure did give you the eye didn't he? I joined in this week Mist! Come and see! Hee...it does have a sinister look to it! Great shots! Misty, I love coming here. Your posts always make me smile. You have got a quirky sense of humor that is just so appealing. :) That bird was definitely watching you! 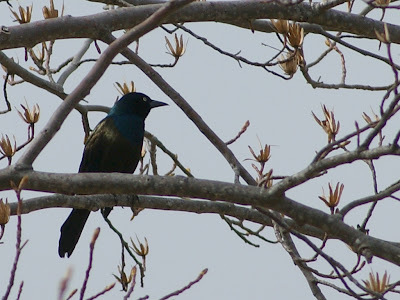 Is it a grackle? LOL funny one! But... you're right, that peak looks awfully sharp. He does seem a bit ominous! Wonderful photo essay and as always you make me smile with your humor! 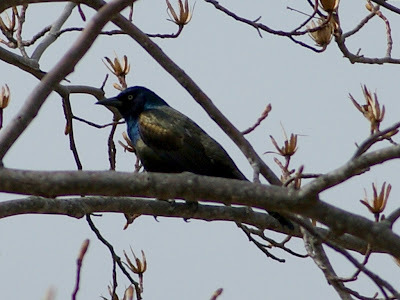 I so love the irreidescence on black birds and I like that blue I see too. Maybe our winged friend told a few lies. I love you post! I never thought of them as scary. But the beak if a tad bit pointy. Have a great week. Beautiful feathers...but you're right, totally creepy eye. I'm running away now, sorry!! Who's the crazy lazy lady taking pix of me :) Ha! 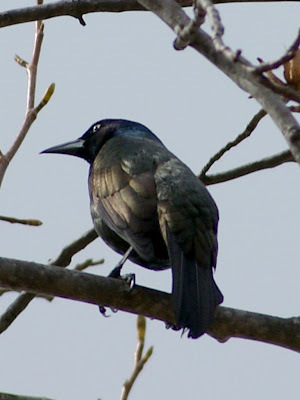 Common Grackles are evil birds. Last year we had one come out here during the Winter. It hung our around my house, but every time I went to find it, it went somewhere else. Evil birds...yes...very evil. 8v) Nice photos. It's the range of colours that are so beautiful. Sh... I think the bird is beautiful but.. shhh.. I still want to gget it. He doesn't seem very impressed that he's getting his picture taken! Have a great day!! Great photos. Your header photo is so precious!! You should NEVER watch the Hitchcock film, The Birds. Seriously! I love the colors on this bird! I finally got a zoom lens for my camera, so I will be trying my hand out at birds when I get a chance. This week, I'm featuring B/F/Fs for my CC. Happy Weekend!!! great capture. Such a lovely bird. Thanks for visiting my blog. Love the last two photos - the way you can see the individual feathers!!! 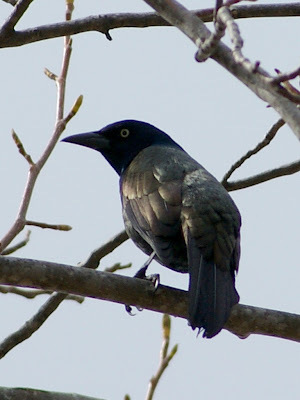 A good series of the grackle. They remind me of miniature crows. As usual I enjoy how you added humor to the post. Very good reading. I loved your photos of this very interesting bird. He is very expressive, at least you make him to be. Fun post! The eye is brightly captured. I like the sharpness of the critters eye. What a cute little feather ball ! Ok, yeah, here I sit all doped up on cold meds then you put that mean evil thing into my head. I will have nightmares for sure! I do love his iridescence though!